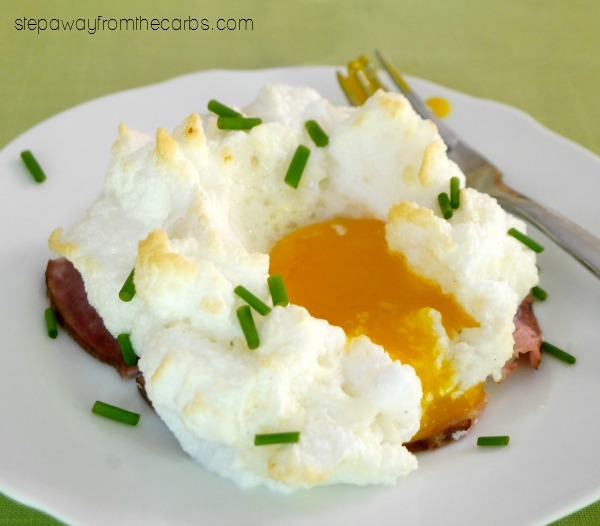 Enjoy this egg cloud breakfast for a low carb start to the day! A runny egg yolk, nestled in a cloud of cheesy egg white clouds, resting on a bed of thick cut ham, and garnished with snipped chives. A good way to start the day? Oh yes! 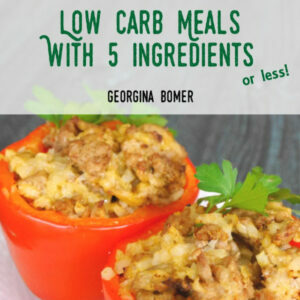 And it is way easier to make than you might think! Separate the eggs BUT ensure not to break the yolks. Place the egg whites in a bowl and whisk until stiff peaks form (I used a hand mixer for this but you could also use a stand mixer). Gently fold in some shredded mozzarella (or preferred cheese) and season with black pepper. 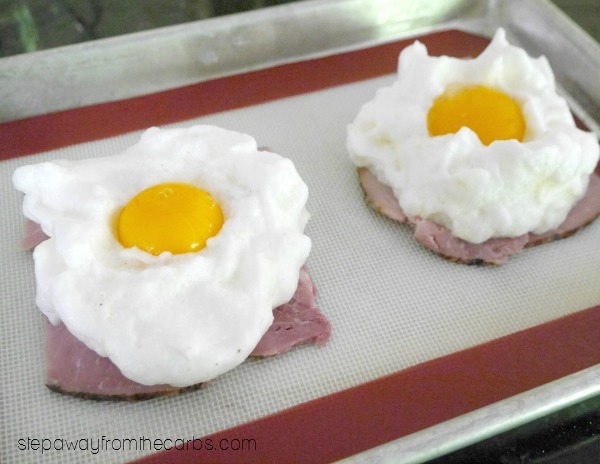 Place some thick slices of ham on a small baking sheet lined with a silicone mat. 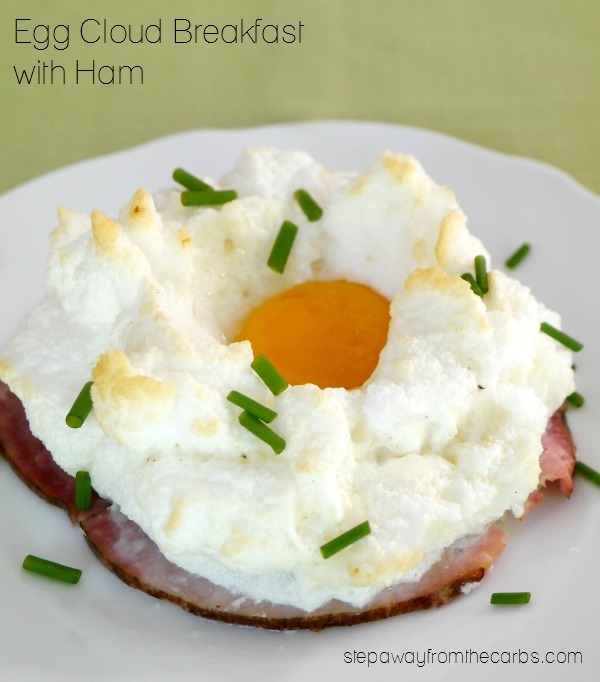 Spoon the egg white mixture over the ham, and make a little indent into each one in the center. Bake in a preheated oven for just a few minutes (this will help the egg white cook in the middle), then carefully add the egg yolks to the center of each cloud. Return to the oven and cook for about 4-5 minutes, or until the egg yolk is cooked to your liking. Transfer the egg clouds to two serving plates and garnish with snipped fresh chives. 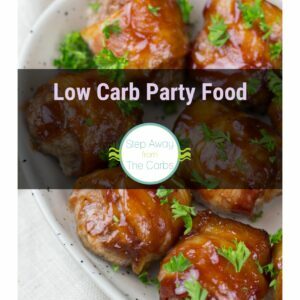 Serve as a breakfast for two people or lunch for one – the carb count is REALLY low!!! Pour the egg whites into a bowl and whisk until stiff peaks form. Gently fold in the mozzarella and season with black pepper. Place the ham on a baking sheet lined with a silicone mat. 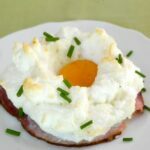 Spoon the egg white mixture over the ham, and make a little indent into each one in the center. Bake in a preheated oven for 2 minutes, then carefully add the egg yolks to the center of each cloud. Return to the oven and cook for about 4-5 minutes or until the egg yolk is cooked to your liking. Transfer the egg clouds to two plates and garnish with snipped fresh chives.